Founded to guide and assist the growth and development of Ju-Jitsu in the United States through international sports and cultural exchange.The USA Sport Ju-jitsu Alliance® was officially formed to represent the World Council of Ju-Jitsu Organisations in the United States to bringing together under one banner, national Jujitsu organizations to participate in the cultural exchange of jujitsu through quality international competition.Contact us at: info@usajujitsu.us. 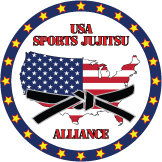 The USA Sport Ju-jitsu® Alliance is a member of the World Council of Ju-Jitsu Organisations (WCJJ), the United States Jujitsu Federation (USJJF) and is affiliated with the USA Traditional Kodokan Judo organization. the USA Sport Ju-jitsu Alliance Team to the World Confederation of Jujitsu organizations October 26-29, Queensland, Australia! 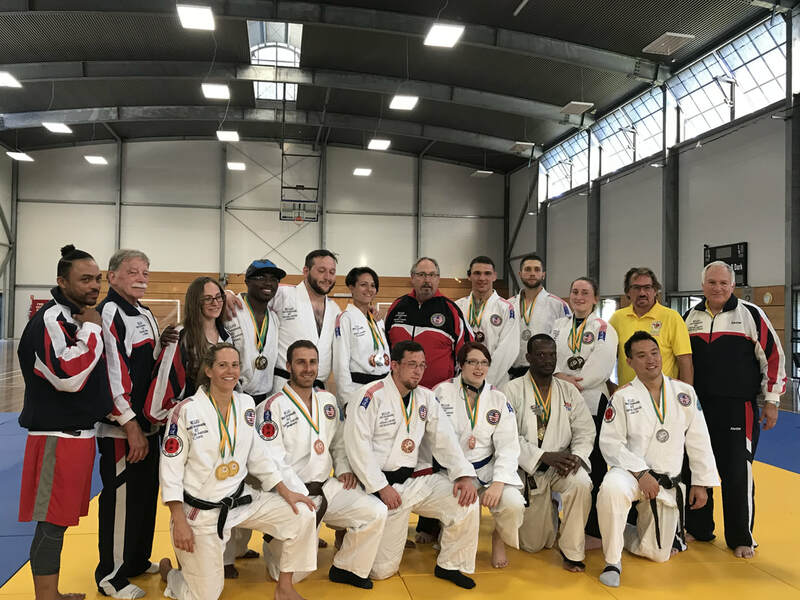 The USA Sport Jujitsu™ Team dominated the 2017 World Council of Jujitsu Organizations (WCJJO) World Championships held on October 27-29, 2017, on the Gold Coast in Australia. This event attracted a number of countries throughout the world. USA dominated by taking 32 of the 44 available gold medals winning the majority of the divisions in Brazilian Jujitsu grappling (BJJ), individual sports jujitsu fighting competition including both adult and senior divisions and by taking the Men’s and Women’s team competition. This is the first time the USA has won the overall medal counts at the WCJJO Championship in the 40-year history of the WCJJO. The WCJJO, which celebrates their 40th anniversary this year, held the first World Championship in Hawaii. The host country has been rotated each time with the last few years being Andover, England, Geneva Switzerland and the Gold Coast in Australia. The next World Championship will be held in the USA in 2019. Leonard Settles the Alliance Team Co Captain and veteran of 4 World Championships led the USA to victory. 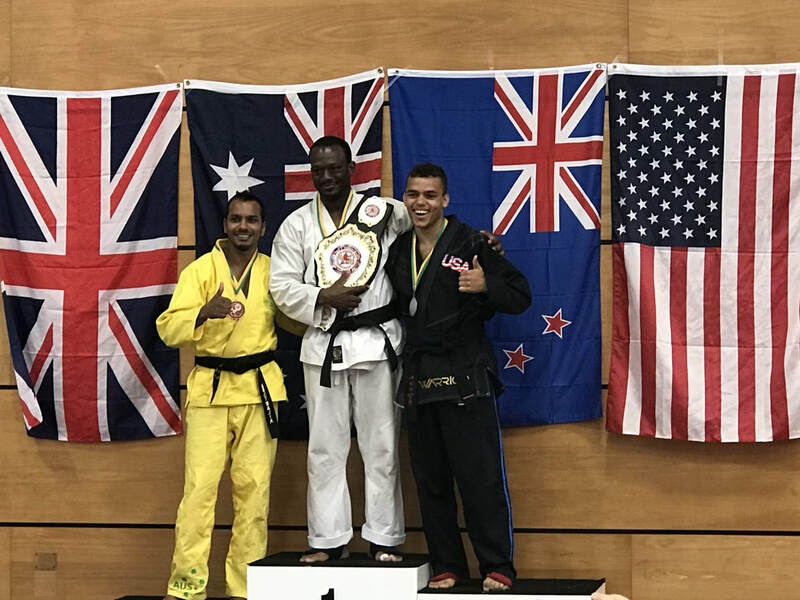 Settles was undefeated in the weekend of events, competing in the Masters Division, BJJ Grappling, Individual Sport Jujitsu and Men’s Team competition winning 3 Individual gold and a team gold medal as well as registering a record, 11 second fast submission in the Individual men’s competition. Michael Antonides the USA Delegate and Executive board member of the WCJJO stated, “The USA Team has been training for the past 2 years and team members were selected from a pool of competitors from 4 different Jujitsu Associates participating on 2 teams. Those associations worked extremely hard in their recruitment and training as well as fund raising to produce this Championship Team.” The cost of training, uniforms and travel for USA team members is the responsibility of the individual competitor, USA Sports Jujitsu was able to provide some of the funding to the competitors from fund raisers and individual donations and Kwon USA provided some support for the cost of uniforms and equipment. The USA Team competition members were made up from The American Jujitsu League, Jujitsu America, United States Jujitsu Federation and The USA Sports Jujitsu Alliance. The AJL and USASJA team each entered as separate associations within the WCJJO competing against each other during the individual competition while the other organizations fed players to the entering organizations. However, all were combined during the Team Competition and included in the overall Medal count. Antonides said “It was definitely a benefit to have the combined support from the two associations as it helped the USA dominate against the very large Australian and strong English team. Ohio had a large number of competitors on the team including Director Mike Antonides from Ashland, Competitors Tirzah Gunther, Lucas Mast and Matt Butterbaugh from the Millersburg area in Holmes County, the Alliance Head Coach and competitor Leonard Settles, and competitors Joseph Stillisano, Sarah Thompson and Anna Seymour from the Cleveland Area and AJL Coaches Shawn, Craig and Isaac Chitwood and competitors Craig Chitwood, Mark Whitman, Katie Seher, Chris Tedjeske, Johnny Jardon, Aaron Behr and Vince Cooper from the Mansfield/Columbus area. Other Competitors from the USA were from New York, North Carolina, Florida and California. ​See our Facebook Page for information on our special seminars with USA Sports Jujitsu Alliance Team Coaches and Competitors including World Champions! Send us your favorite photo and we will add it to our random photo list! international sports and cultural exchange.